Role: Leader, controller. You both heal and boost your allies strength, assisting them while also controlling the battlefield. Power Source: Primal, Martial. The spirits of the natural world give you power and manifest on your behalf, which enhance your natural fighting abilities. Trained Skills: Nature. From the class skills list below, choose 3 more trained skills at 1st level. Wisdom should be your primary ability. As almost all of your powers utilize wisdom for the attack and damage roll, wisdom is your most important ability. Your second most important ability is your dexterity modifier, which boosts your secondary powers and defenses. Your tertiary favored ability is constitution, which has significantly less importance. Races which have dexterity or wisdom as their primary attributes are ideal for the class, such as the Elf, Dark Elf, Wisden or Thri-keen, however a wisdom primary class can be effective as well. Hunters are as much about helping their allies as they are about controlling the battlefield. While they are not oriented to dealing damage, their damage is above average for most leaders, and their powers often allow them to target multiple opponents at once. This gives them the ability to control the battlefield more effectively, and boost their allies damage in combat. Damage oriented feats, such as weapon proficiency and expertise feats can enhance the raw damage of the Hunter, and two-weapon fighting, or feats which boost dual-wielding can be beneficial as well. Your damage will always be slightly less than a striker, but can be beneficial to the group to help clear minions or monsters faster. Class specific feats such as Totem Master (4e Feat) which allows you to summon two different types of totems at once or Obelisk (4e Feat) which allows you to make the totem count as a 4 x 4 zone and provides and additional boost to your allies, are also recommended. As you use dexterity as your secondary ability, it is highly recommended that you start with light armor, either leather or hide armor, to receive the best bonus to defense possible. As your damage relies heavily on your weapons as well, it's recommended that you focus on a two one-handed weapons, a two-handed weapon, or a ranged weapon. Superior weapons and armor can be beneficial to boost damage, although are not necessary given your role. Items which boost healing powers, or elemental powers can be useful depending on the powers you choose. Implements are also a good choice, however that may be more difficult to obtain and conflict in part with your magic weapons. When you wear or hold your totem, you can add its enhancement bonus to the attack rolls and the damage rolls of powers that have the implement keyword. You can also add its enhancement bonus to the attack rolls and the damage rolls of weapon attacks you make using a weapon with which you have proficiency. You can also use a weapon as an implement if you are proficient with that weapon. When wielding the weapon as an implement, the weapon's characteristics-proficiency bonus, damage die, and weapon properties like defensive or high crit-are irrelevant to your implement powers. Only the weapon's enhancement bonus applies to implement rolls. You must choose the "Hunter" fighter path to gain all of the following features. You cannot simply choose some of the features as new additions to the Shaman, but instead are given these powers by choosing the path. You use all of the same Shaman encounter, utility and daily powers in addition to the newer Hunter powers, but must use the described class features. You can choose at-will powers from the shaman class in addition to the newer at-wills presented, however the compatibility between the powers of each path depends heavily on your chosen features (for instance, beast keyword powers are not usable by the hunter). Despite your focus on extra controller oriented abilities, you are still predominately a leader, with many healing powers. 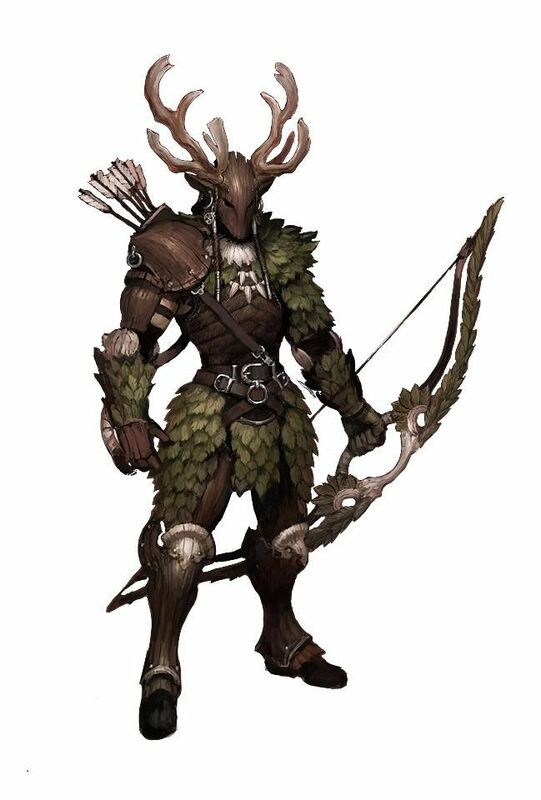 The Healing Spirit power of the Hunter functions almost identically to the original "Healing Spirit" power of the Shaman, in the Player's Handbook II guide, however the 1d6 benefit can be your totem instead of one creature adjacent to your spirit companion. For the purpose of meeting prerequisites, the power functions as the same. You call to the spirits on behalf of a wounded ally, closing wounds and filling your ally with vigor. Effect: The target can spend a healing surge. If the target does so, one ally other than the target adjacent to your spirit totem, regains 1d6 hit points. Level 6: 2d6 hit points. Level 11: 3d6 hit points. Level 16: 4d6 hit points. Level 21: 5d6 hit points. Level 26: 6d6 hit points. You gain the speak with spirits power, which is identical to the Shaman power in Player's Handbook II. You are aware of the constant presence of spirits that float at the edges of reality. You can focus your inner energy and open your mind to these spirits, letting them guide your actions or fill you with insights. You commune with the spirits, letting them guide your words and actions. You gain access to the "Spirit Totem" power. The Spirit Totem power gives you the ability to summon a Totem within 20 squares of you, and provides a bonus to all chosen creatures within 20 squares of the totem. The exact bonus depends on the totem you choose, which includes the Fire, Water, Air, or Earth totem. You may move the totem your speed as a move action. The totem is immune to damage and cannot be destroyed, and enemies may not move through the squares the totem occupies, but allies or you can. A totem is dismissed at the end of the encounter, or can be dismissed with a minor action. Only the effect of one totem blessing may be applied to any creature at any given point in time, even if multiple totems are on the field. If multiple totems are summoned, such as by multiple shamans, only one totem blessing is applicable to a creature even if they are within range of another totem's blessing. Fire Totem: Enemies that end their turn adjacent to the fire totem take fire damage equal to your wisdom modifier. In addition, the fire totem can make opportunity attacks against any creature moving past it, using your implement bonus and wisdom modifier vs. reflex for the attack, and dealing your wisdom modifier and implement bonus as damage. Enemies struck by the attack stop moving, but can continue moving if they have remaining actions during their turn. You and your allies within 20 squares of the totem deal an extra two fire damage with all damage rolls, which increases to three at level 11, and four at level 21. Water Totem: Allies that end their turn adjacent to the water totem can choose to regain hitpoints equal to your wisdom modifier, or instead gain temporary hitpoints equal to your wisdom modifier. Your and your allies within 20 squares of the totem gain regeneration 1, which increases to regeneration 2 at level 11, and regeneration 3 at level 21. Air Totem: Spaces in or within two squares of the Air Totem are treated as light cover and concealment for your allies, and lightly obscured spaces for your enemies. Your or your allies that end their turn adjacent to the Air Totem can ignore all opportunities attacks until the end of their next turn. All allies within 20 squares of the totem can shift two extra squares when taking a shift action, and can ignore difficult terrain when they shift. In addition, if an ally is hit with an attack, you can choose for the ally to deal thunder and lightning damage to the target equal to your dexterity modifier. Earth Totem: Spaces within two squares of the earth totem are treated as difficult terrain for your enemies. In addition, enemies adjacent to the Earth Totem are slowed until the end of their next turn. You or your allies adjacent to the totem gain a +1 bonus to all defenses (when adjacent to the totem). You and your allies within 20 squares of the totem gain Resist 2 to all damage, which increases to Resist 4 at level 11, and Resist 6 at level 21. You call to the spirits to bestow a blessing on all of your allies, using your totem to manifest their power. Effect: You summon a "Spirit Totem" within one unoccupied square within range of the power. While you or your allies are within 20 squares of the totem, they gain a blessing that augments their powers based on the totem of your choice. The totem choices include the Fire, Water, Air, and Earth totems. Special: You may move the totem your speed as a move action during your turn. The totem is immune to damage, and cannot be destroyed. In addition, enemies cannot move through the totem's space, but you or your allies can. Totem's occupy one square, unless another power augments their size. The totem is dismissed at the end of the encounter. You gain either the "Primal Hunter" or "Dual Focus" class feature. Primal Hunter: You gain a +4 bonus against opportunity attacks occurred while moving or using a ranged weapon. In addition, you can draw or sheathe a weapon one per turn as a free action, and gain the "Quick Draw" feat, even if you don't meet the prerequisites. Dual Focus: You gain two-weapon defense as a bonus feat, even if you don't meet the prerequisites. In addition, you can use a one-handed melee weapon in your offhand, as if it were an offhand weapon. Benefit: You can choose to gain two of the following at-will powers, or select other fighter at-will powers. At level 21, the damage increases to double that damage die. You strike quickly with two attacks, using your blinding speed to throw your enemy off blanace. Special: You can choose the damage type of the attack to be Acid, Cold, Fire, Lightning, or Poison. You strike with a ferocity that effects all of the enemies around you. Hit: 1[W] + wisdom modifier damage. Special: Each enemy adjacent to either you or the target takes additional damage equal to your dexterity modifier. You ambush your enemy, utilizing your superior maneuvering skills and stealth to set up the strike. Special: You can shift two squares before or after the attack. In addition, if you have light concealment or cover, or greater, you gain combat advantage for the attack. You dig the fangs of an ancient spirit in to your enemy, halting their advance. Hit: 1[W] + wisdom modifier damage and the target is slowed until the end of your next turn. Special: You can use the power in place of a melee basic attack. Your totem lashes out, dealing damage to a nearby enemy. Requirement: You must make the attack with your totem. Hit: 1d10 + wisdom modifier damage, and one ally adjacent to the totem gains combat advantage against the target. Special: You can use the power in place of a melee basic attack. In addition, the type damage the totem deals is based on your totem of choice, dealing Fire damage with your fire totem, Cold damage with your water totem, Thunder damage with your air totem, or Poison damage with your earth totem. Your totem lashes out, dealing damage to a nearby enemy and healing a nearby ally. Hit: 1d8 + wisdom modifier damage, and one ally within 5 squares of the totem can either regain hitpoints equal to your wisdom modifier, or gain temporary hitpoints equal to your wisdom modifier. Special: The type damage the totem deals is based on your totem of choice, dealing Fire damage with your fire totem, Cold damage with your water totem, Thunder damage with your air totem, or Poison damage with your earth totem. You can choose the following powers in addition to other Shaman powers at the appropriate levels. You strike the target with the reckless abandon of a ferocious jaguar, rushing headfirst in to combat. Special: If both attacks hit the same target, the target is weakened until the end of your next turn. You strike like an eagle, leaping through the air to your target, surprising them and taking them off balance. Hit: 3[W] + Wisdom modifier damage. Special: Before the attack, you may fly your speed. If you end this movement adjacent to the enemy you are targeting with the attack, the target grants combat advantage to you and your allies until the end of your next turn. You consecrate the ground around your totem, sanctifying it for the spirits. Hit: 2d8 + Wisdom modifier damage. Special: The area within the close burst 5 becomes sanctified ground, becoming a zone qualifying as difficult terrain for enemies that pass through it. While in the zone, all creatures are treated as if being adjacent to the totem, including allies and enemies, and are subject to the totem's effects. The zone lasts for two turns, or until the end of the encounter with a sustain minor. You can choose the damage type of the attack to be Acid, Cold, Fire, Lightning, or Poison.